By now, you may have thought I had given up on my 28 Things since I haven't written about any of the items on my list in the past three months. It's a shame because my way to keep on track was to do seven items a quarter and I'm way behind, but aren't things more fun to do with a little pressure? 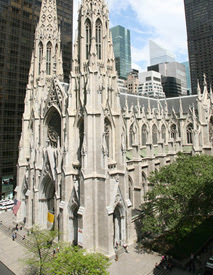 St. Patrick's Cathedral is arguably (or is this even an argument?) the most iconic church in the city. It's right across from Rockefeller Center so if you get overwhelmed by the crowds from the tree and people window shopping, you can duck in there and be quickly transported somewhere other than midtown Manhattan, somewhere peaceful. Carrie suggested this for my list which was perfect because it was something I've been meaning to do since I moved to the city, especially to the east side. I decided the best way to complete this item on my list would be during the holiday season, since the church would be decorated and the choir might sing some of my fav carols. Aubrey and I attended the 10:15 mass a few Sundays back and it was fantastic. The church is currently under renovation so there is ugly scaffolding outside but don't let that stop you, the inside is beautiful. There is room for about 2,000 people to sit during mass and there were plenty of people standing as well. We actually got seats right behind a giant column, but that didn't matter because there were tv screens on the columns so that everyone could see Cardinal Dolan, Archbishop of New York and frequent blogger and NY morning show guest, perform the mass. We stayed after mass to check out the deets, the shop, and the decorations, especially the Nativity scene in which for some reason, in addition to the camel and lamb, a Labrador retriever is present (I may have missed something). Growing up Irish Catholic, I obviously got an extra kick out of being at St. Patrick's Cathedral, but I recommend a visit even if you didn't grow up Christian or aren't religious at all. When I travel, I love visiting churches and sacred places, mostly because they are typically centuries old, with extremely detailed architecture, and are peaceful spots to reflect upon how far you've come - in miles and in life. Katie and I will be visiting a lot of Buddhist temples while we're in Thailand, which is awesome, because according to my mom, every time you are in a new house of worship, you get to make a wish. And I have lots of wishes.